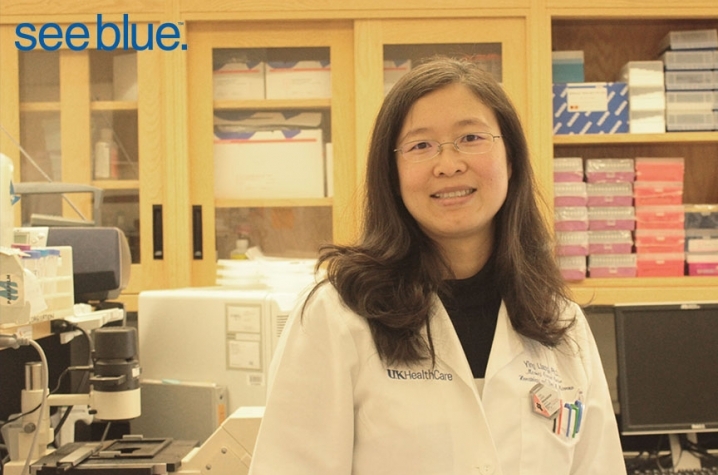 LEXINGTON, Ky. (Jan. 5, 2016) – Five days before Christmas, University of Kentucky researcher Ying Liang, MD, PhD, received what she described as the best gift ever: a letter of notification that she received a prestigious R01 grant, totaling $1.88 million over five years, from the National Institutes of Health. Not only was it her first such award, she scored at the second percentile, an uncommonly high score indicating that her proposal was nearly flawless. A glimpse of her CV and her obvious passion for research render the award somewhat less surprising. 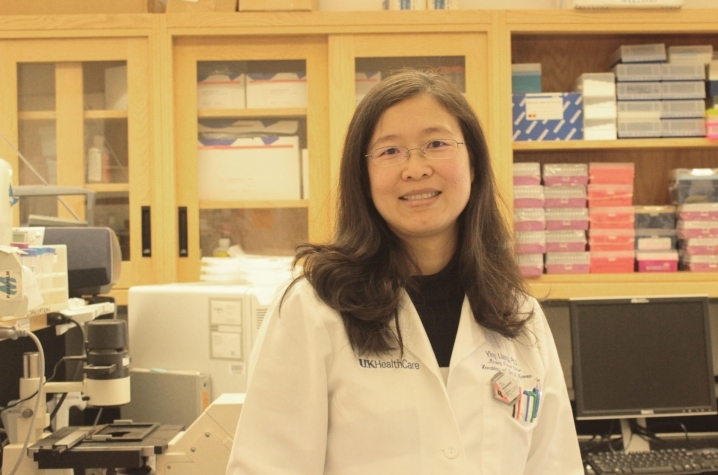 Liang, assistant professor of toxicology and cancer biology, describes research as “thrilling," and she's dedicated her career to studying a gene that affects stem cell damage from chemotherapy and radiation. She actually helped to discover the gene, called Latexin, about 10 years ago while she was a PhD candidate at UK and member of Dr. Gary van Zant’s lab. When they published their findings in 2007 in the journal Nature Genetics, she was listed as first author. “It was the first time this gene’s known function in the stem cell was published,” she said. The Latexin gene, as it turns out, could hold a key to protecting healthy blood and stem cells during cancer treatments, the ultimate aim of Liang’s work. Chemotherapy and radiation therapy target cells that multiply rapidly, as do cancer cells, but healthy cells that rapidly multiply are also damaged in the process. This includes not only hair cells (which is why many cancer patients temporarily lose their hair during treatment), but also blood cells and stem cells in the bone marrow. The damage to these blood and stem cells causes serious short-term consequences, such as bleeding problems and elevated risk of infection, that can drastically increase mortality for cancer patients. Long-term problems loom, too, as cancer therapy-induced stem cell damage can lead to cell toxicity and secondary cancers years later. Liang hopes that understanding the molecular mechanisms of the gene that affects stem cell vulnerability to cancer therapies could eventually lead to methods to protect these cells during treatment. “No matter what you study, you have to understand what’s going inside the cell and underlying mechanisms before you can have any kind of drugs or treatments for patients. That’s something I feel really excited about,” she said. It was this excitement for understanding the why that led Liang away from clinical practice and into the research world 15 years ago. Before moving to the U.S. to pursue her PhD, Liang completed medical training in China at Beijing Medical University and treated patients for three years as a physician. The whole time, though, she couldn’t shake the excitement she’d felt during her limited research experience as a student. She decided to pursue such opportunities in the U.S., and in 2000 came to UK for a PhD in physiology. She was among the inaugural class of the Integrated Biomedical Sciences program.The following year she joined Van Zant’s lab, which focused on stem cell biology, genetics and aging. After helping to discover the Latexin gene, publish their findings, and apply for several related patents, she continued to study the gene’s function as a postdoctoral fellow. She then served as a research assistant professor at the University of Illinois from 2009 to 2011 before returning to UK as an assistant professor in the UK College of Medicine. Coming back to UK “felt like coming home” and quickly presented a significant boost to her research efforts. In 2012, she received a KL2 Career Development Award, from the UK Center for Clinical and Translational Science, which offers robust support to foster junior investigators in obtaining independent awards. The program provides salary support for protected research time, didactic coursework, interdisciplinary engagement, and mentored research training. Liang credits the program as crucial in catalyzing her research towards a top-scoring R01 application. She has also received substantial support from the Markey Cancer Center, the departments of internal medicine and toxicology and cancer biology, and the Office of Grant Development. “I feel so lucky to be supported by this KL2 program because it gave me protected time to really focus on the research project,” she said. She describes the multidisciplinary mentorship of the program as especially helpful in navigating the challenges of clinical and translational research. Her KL2 mentors included Van Zant; Charlotte Peterson, PhD; Daret St. Clair, Phd; Subbarao Bondada, PhD; Kathleen O’Connor, MD, PhD; Susan Symth, MD, Phd; and Mary Vore, PhD. Her KL2-supported research focused on identifying the function of the Latexin gene in bone marrow stem cells in both normal and diseased conditions. Specifically, she examined the impact of the gene on human leukemia stem cells that were transferred to mice. She found that 80 percent of mice exposed to radiation after the gene was down-regulated survived without stem cells problems and didn’t die from secondary illnesses, compared with only 20 percent that received radiation without inhibiting the gene. Over the next five years, her R01 grant will build on this research to determine if deleting the Latexin gene makes stem cells more resistant to damage during cancer treatments and to understand the mechanism of the effect. She will also employ human models as well as state-of-the-art molecular and genomic techniques. Vital to the research project are interdisciplinary collaborations with Gerhard Hildebrant, MD, PhD, chief of the Division of Hematology and Blood and Marrow Transplantation, and Chi Wang, PhD, assistant professor of cancer biostastics. Liang hopes that understanding the mechanism of the gene could allow the development of a treatment, before or after radiation, to protect against radiation-induced damage to bone marrow. Such a treatment could benefit the many patients who receive cancer therapy or bone marrow transplants. She’s aware that this pursuit could be a lifelong process, or could even extend beyond her own career, but she’s comfortable seeing herself in the lineage of accumulated research knowledge. In the context of helping to discover the Latexin gene she now studies, she quickly acknowledges the years of preliminary work conducted by other researchers before she even joined the lab. “I’m the first author (on the paper about the gene’s discovery), but there was years and years of work by people before me. My mentor, Dr. Gary Van Zant, put his whole career into this project. Knowledge and models get passed down, and I’m lucky to be able to continue it. Maybe in my life I’ll just identify part of this gene’s function, and then pass it to someone else. But somehow we have to figure out what’s going on,” she said. Now as a mentor and professor herself, she’s already working to further the lineage of her research, and knows that cultivating curious and self-motivated students is essential. Her first mentor, Van Zant, asked her a similar question when he first met her: What do you want to do in the future? She told him that she wanted to continue doing science with good publications. If she wanted a near-perfect score on an R01, she didn’t ask for it directly. In her fastidiously uncluttered office, only one paper is visible, adhered to the wall just beside her computer. It’s a half-sheet of regular printer paper that Van Zant gave her 15 years ago, and it’s the only thing she’s displayed in each of her offices over the years. The visible holes from pushpins suggest that she’s had about 12 distinct workplaces; otherwise, the page is in surprising good condition for its age. 1. What is the burning question? 3. How are you going to answer the question? 5. What are the conclusions? Can you formulate a model? 6. What do you do next? She generously passes the gift of this wisdom to the upcoming generation of researchers she works with.